After leaving Millmerran it was onto Goondiwindi where I had my first country bakery slice of the trip. The best thing about country bakery slices? The price. $2.50 in Goondiwindi, $2.20 in Narrabri, $2.30 in Gunnedah, $2.70 in Glen Innes. You’re hard pressed getting change from $5 if you want slice in Brisbane regardless if it is from an old school bakery or a cafe. The next best thing about country bakery slices? The variety! and the interpations of classic slices that leave your head spinning in a good way from the sugar overload. Oh I spent some time pondering the choices! My go to slice is caramel slice. Some people judge a bakery by the quality of the vanilla slice. I judge it by the caramel slice. I’ve had a lot of caramel slice over the years and the two key criteria for a caramel slice is a base with some crunch and flavour in it (desiccated coconut is good here) and the caramel needs to be just the right colour and taste. Not cooked enough and it tastes like sugar and nothing else on the other end of the caramel scale if the caramel is burnt then it just tastes darn awful. In saying all that I don’t recall ever making caramel slice, probably because I know very well that if I was to make caramel slice, it wouldn’t last very long in the container as it would be down my gob pretty quickly. In Goodniwindi I was tempted by the caramel slice, I was also tempted by the apple slice but then I saw the holy grail. Peppermint slice! Oh sweet peppermint essence. I don’t see many peppermint slices round the bakery traps any more and I would much rather see peppermint slices than cherry ripe slices. 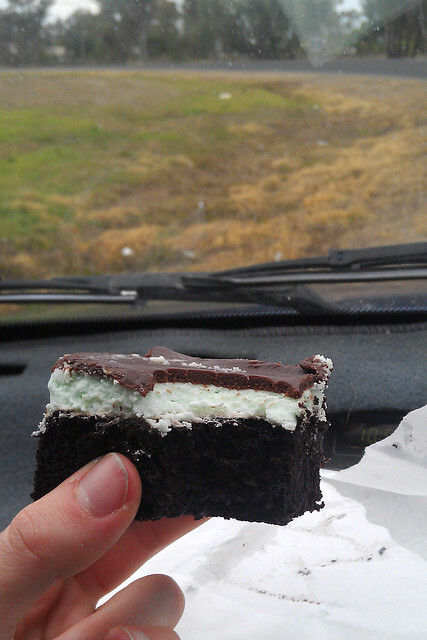 This was the peppermint slice in Gundy. Just look at it! It’s on a mud cake base!!! The peppermint filling is tinted green!! All up a pretty good slice as I felt sick and overloaded on peppermint at the end of the slice. The next two slices came from Watson’s Kitchen in Narrabri. I thought this slice was a lemon meringue slice (how good would that be? 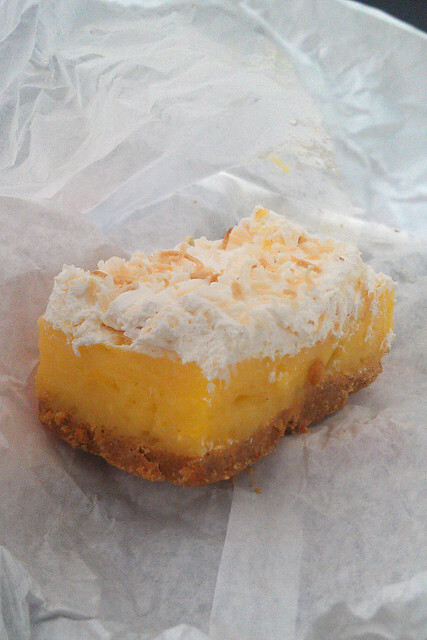 ), it was actually an egg custard slice with a cream icing. I wasn’t sold on this slice but for $2.20 I wasn’t complaining. The next slice was in Gunnedah. I didn’t take a photo. 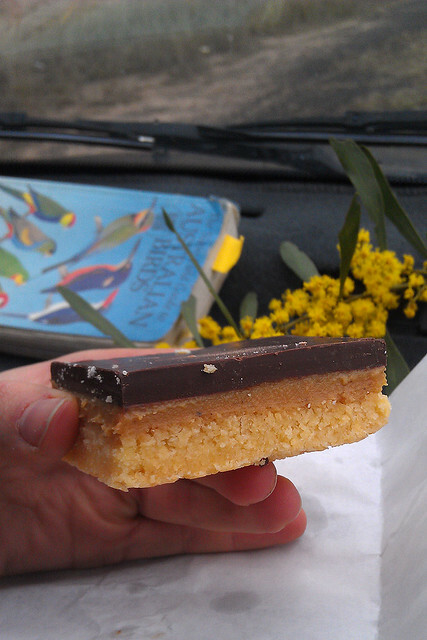 The caramel slice in Gunnedah didn’t deserve a photo. The caramel was very burnt, so much so that I thought it might have meant to be a burnt treacle caramel slice. It received a 2/10. It was only redeemed by the nice base it had – nice and crunchy. I was tempted to get another slice from a different bakery on main street in Gunnedah but decided not to increase the sugar levels too much. The last slice of the trip was in Glen Innes at Smeatons Bakery. I didn’t like the look of the caramel slice and was in a bit of a dilemma over getting peppermint slice again or getting their Mars bar slice. 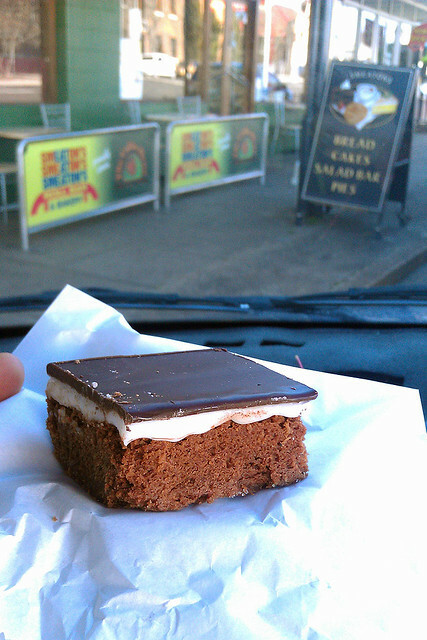 As you can see from below I got the peppermint slice and it was pure traditional peppermint slice – yum, yum, yum. I would have liked the base a little thinner and a bit more peppermint filling but it was still yum, yum, yum. Now, let me tell you about their Mars bar slice. I kid you not the slice measured at least 8cm tall! It was a Mars bar slice on steroids, it wasn’t the usual Mars bar slice, it had a chocolate cake base!!! Yes, it was a chocolate mud cake base, topped with Mars bar rice bubble goodness and topped with a layer of chocolate. Next time I’m going through Glen Innes I’ll be trying the Mars bar slice. Five days, five slices, four photos, a whole lot of sugar. Signs to here, there and everywhere. A good read and giggle!